Uglyworld #792 - Trunko at Rockaway Beach, originally uploaded by www.bazpics.com. After Trunko had helped me spot "Hobo Matt" at the Stonehenge Memorial during our daytrip to Mount Adams, he had been completely mesmerised by his daily blog which detailed his trip all the way from Rockaway, New York to Rockaway Beach, Oregon. As we drove through the small coastal village of Rockaway Beach Trunko suddenly realised that this was the final stop of Matt's journey, "This is where all finished, and he runned into the oceans". 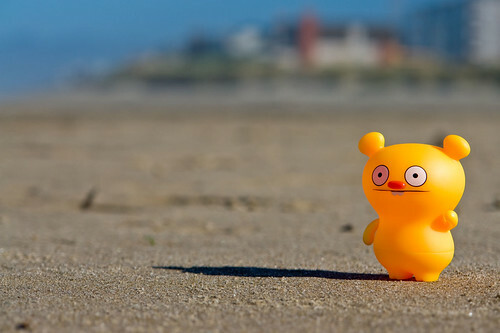 Without further ado Trunko went sprinting down the beach and into the water of the Pacific which lay ahead, "Flippin' hecks, the waters is freezings" he screamed as he ran back in the opposite direction.